On Sunday, City of Oslo, VisitOSLO , and Ruter hosted Turist i Egen By , an annual event which, in English, translates to Tourist in Your Own City . Free Oslo Passes for everyone! 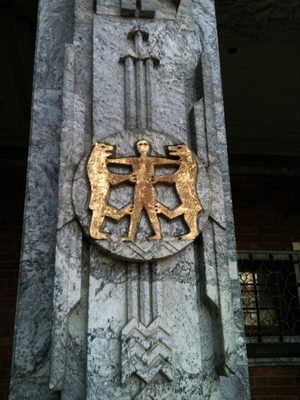 I'm a huge fan of the Oslo Pass, and I always recommend it to people visiting for more than two or three days, because it includes access to most of the major museums here in Oslo, as well as access to all public transportation (buses, trams, trains, ferries). 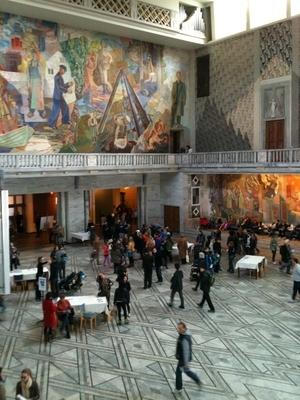 The Turist i Egen By event appeared to be a HUGE success. It was one of the most crowded afternoons I've ever seen in the city. The line to board the ferry to Bygdøy wrapped across Rådhusplassen to the Nobel Peace Center and beyond. 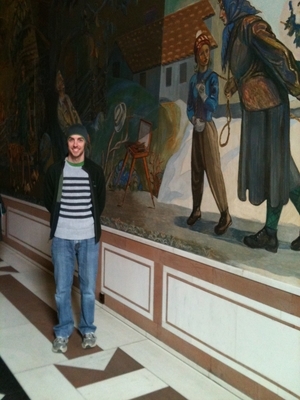 And since we've been to so many museums, galleries, and other exhibits here already, Jonathan and I decided to tour Oslo's City Hall instead. Rådhuset is a very distinct building, with its twin brick towers. It was completed in 1950, 19 years after construction began. 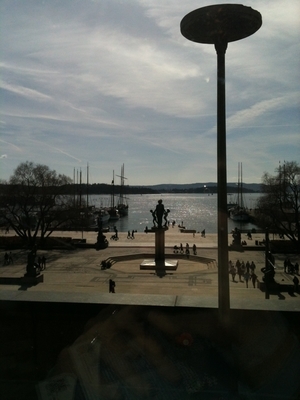 Construction was postponed during WWII, when Oslo fell under Nazi occupation. The drama of the city hall comes from more than the monolithic structure--intricate murals and powerful statues, each full of symbolism, cover the walls, inside and out. There's no denying that the building doesn't fit in with classic Scandinavian architecture, considering the heavy textiles and blunt corners, but in 2005, Rådhuset was named Oslo's "Structure of the Century." 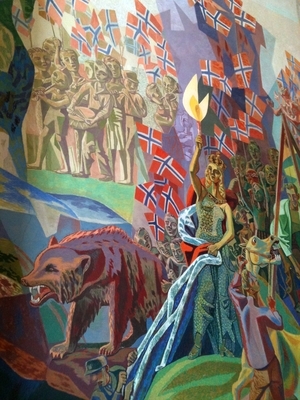 Famous Norwegian artists were commissioned for the murals in each of the event rooms. 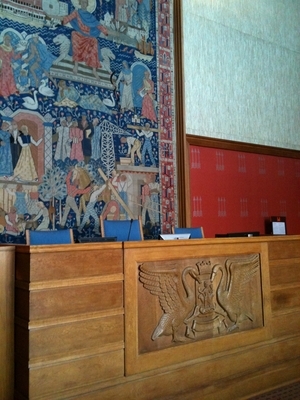 The Great Hall (above left) hosts the Nobel Peace Prize ceremony . 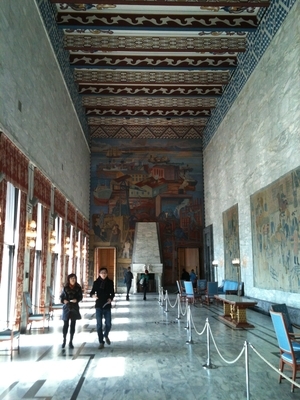 "On December 10 every year, the traditional ceremony for the Nobel Laureate is held in the Oslo City Hall. Prominent personalities such as Barack Obama, Aung San Suu Kyi, Kofi Annan and Nelson Mandela have all entered the podium here to receive this highly recognized prize." The eastern tower includes a 49-bell Carillon which rings in each hour throughout the day. "In 2000 a majority of the carillon's bells were replaced. Additionally, 11 bells were added to the total number. The bells are cast in bronze, consisting of 78% copper and 22% pewter. The largest bell weighs as much as 4,000 kilograms, while the smallest bell weighs as little as 14 kilograms." Oslo is a city of bells, particularly on Sundays. I've ended many a long, summer evening sitting near the water at Aker Brygge, eating ice cream and listening to the bells singing Somewhere over the Rainbow . The city hall also includes a courtroom, but it's definitely far different from the kinds of courtrooms I'm familiar with as an American (and Law & Order fan). 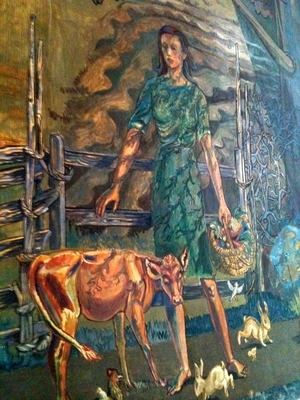 Some of the artwork on the walls of the city hall's interior scared me a little (giant bees descending on a city and pushing the humans into concentration camps... no, I'm not kidding), but much of it just made me smile. The mural above was my favorite. The Princess and the Bear. Go Norge! And then, aside from the grand paintings, there's the view out the windows. Rådhusplassen is one of my favorite spots in the city. 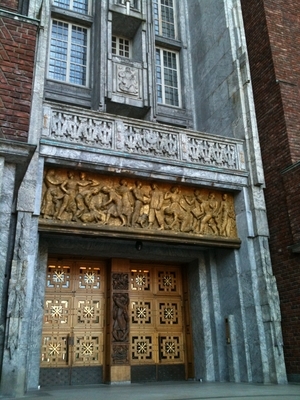 After the Oslo bombing and the Utøya massacre on 22 July 2011 , the memorial rose ceremony took place here. It was an unforgettable moment of solidarity and spirit. Thinking of what that must of looked like from within the city hall--more than a hundred thousand people, silent, raising long-stemmed roses into the air so that the blooms quivered in collective mourning and remembrance--stopped my heart... and restarted it again. 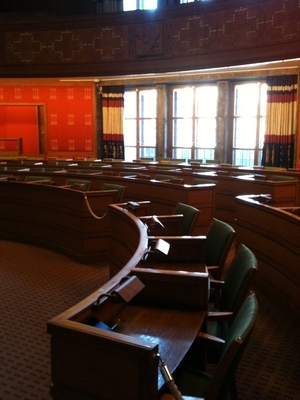 Rådhuset is a public building and is open to visitors. Visit their website for details .